This fairy birthday card with envelope has an interesting fold. It opens fully flat with a space in the middle for your message. 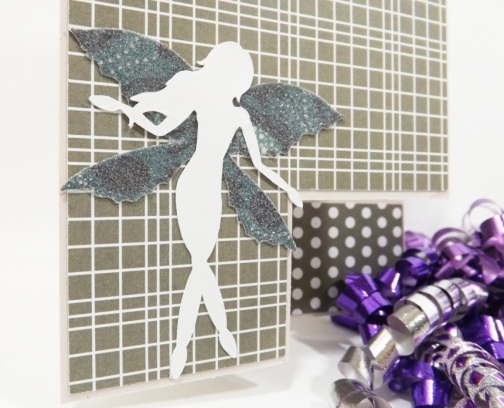 The fairy is an orignal Fairy Cardmaker design. The wings are glittered with a pattern beneath the glitter. 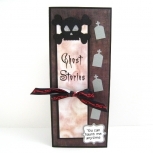 With such a magical creature on the card, of course the sentiment must say, "make a wish!". This fairy birthday card is predominantly grey. 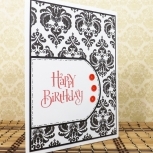 The birthday card measures 4 inches (10 cm) by 5.5 inches (14 cm), is made from cardstock, and comes with a plain, white, peel'n'seal envelope. The body of the card is a vanilla brown. It is the buyer’s responsibility to know when and how to self-assess and report any local taxes, customs or duties, where applicable.